If you hadn't figured it out yet, today I'm starting with hair! It's funny, I seriously hate doing my hair. I only wash it every 3-4 days for it's health, but mainly because I hate drying and styling it. With such thick, long hair it takes me forever and I'm always late because of it. But at the same time, I don't feel put together if my hair is a hot mess so I always do something to style it. I wanted to create a fun and simple look for Valentine's Day that you can easily wear throughout the day and touch up at night. I am wearing my hair extensions to give my hair some more length for my braid. I personally like the messy, loose look of the fishtail braid because I don't like having my hair pulled tight which gives me major headaches. Anyone else? But you could easily polish this look up a bit by making the fishtail tighter and even adding an adorable bow at the bottom. 1 • I started with one day dirty hair (it holds better for me). My extensions are in and my hair is straightened and brushed. 2 • Pull back the top half and tie using a clear elastic band. Wrap one piece of hair around the tie and bobby pin it on the bottom to keep it in place. 3 • Leaving the ponytail out, separate the rest of your hair into two sections to prepare to fishtail. 4 • Create a fishtail braid over the ponytail by simply crossing one strand from each section back and forth. Continuously alternating. 5 • Tie another elastic band at the bottom and let your arms rest because you are dunzo! I kept my braid loose the entire time I was braiding, but if you pulled too tightly you can just grab small pieces of your braid and give them a little tug to "loosen" your braid. 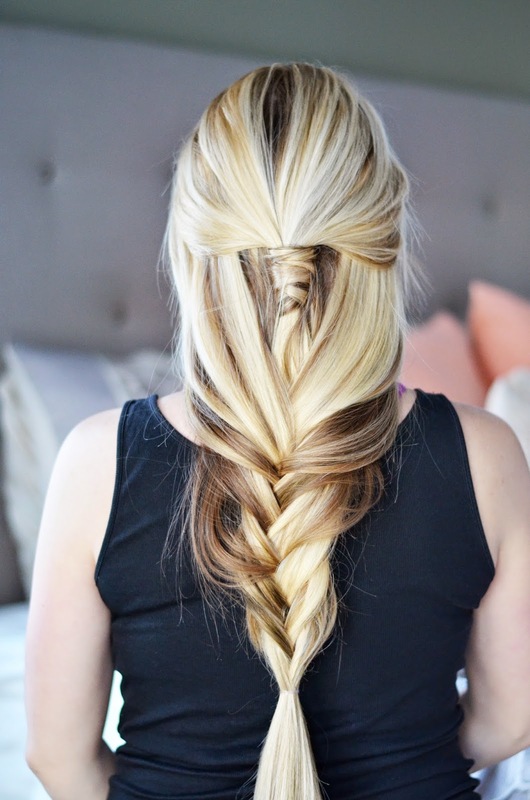 13 comments on "A Simple 5-Step Fishtail Braid"
Wow this looks so awesome! I wish I was good at doing my own hair but I fail at everything I try. I can do a braid off to the side but that's pretty much it! Love this look!! Gorgeous! A fishtail is one of my favorite go-to hairstyles so I love this new spin on it and will definitely be trying it out!! LOVE this! Perfect for Valentine's Day or any day, really! This is so pretty! I wish I had the hair to do something like this, but some of us are stuck with really fine, and short hair... I've been thinking about extensions though. Where did you get yours and how do you like them? Wow! Your extensions are amazing! 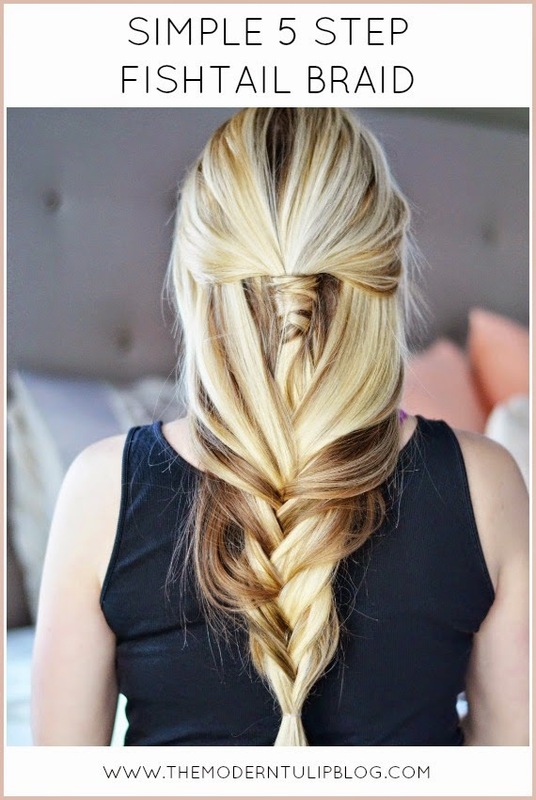 Thanks for sharing, I love this braid and it looks so simple. Perfect for those days when I need something quick and pretty! So pretty!! Love this and great tutorial pics. You make me want to play with extensions! your hair looks flawless here. jealous! gorgeous, girl! it even seems easy enough for me to try! Beautiful! I've never seen one exactly like this, can't wait till my hair is just a bit longer so I can give it a try!